Super Late Post! A lot of things have happened since my first ever Happy Days Club TV appearance-- my baby accidentally fell off the bed :(, workload increased for the next few days, and all the stress piled up until I woke up one early morning with gastroenteritis. It was terrible. I've always been curious about what it felt like to have diarrhea, but I don't think I would want to discover it the hard way. I was still sick the following day, but I knew nobody would be able to work on the stuff I need to finish in the office, so against my doctor's advice I went back to work the next morning. I was pretty sure I was still dehydrated because I screwed up at work the entire week. (So please, if your doctor told you to rest, rest!) It was such a super stressful month! Now that the stressful month is over, here's hoping March gives me fun, happy vibes for four weeks! But first, let me share with you this long overdue post. Happy Days Club was generous enough to send me a box filled with goodies back in February. It arrived about a week after my Happy Days Club TV gig--and a week before my period--so I was over the moon. There were lots of goodies that were sent to me, but on this post I'm sharing my top 5 favorites. If you're interested, I made a quick post about the entire contents of the box in my IG here. 1. 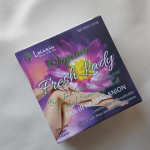 Leiana House of Beauty's Organic Fresh Lady Bamboo Charcoal Anion Herbal Sanitary Pad - a mouthful to say, but each napkin is super thin (possibly the thinnest I've ever seen and used! The herbal scent for me was a little overpowering. I guess it takes a little getting used to, but I think it's fine. I mean, the pad is super thin and absorbent--I don't mind a little herbal scent down there if it means worry-free periods every month! 2. 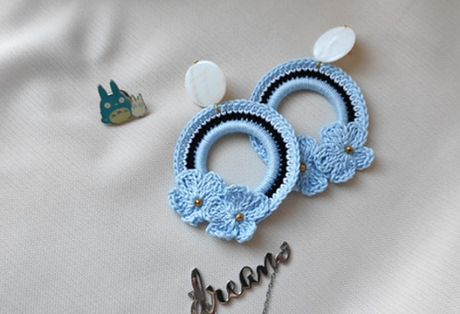 Aislin PH handmade earrings - Super intricately made, I love it! This pair looks like really cute statement pieces, though, so it makes me nervous. I mean, I love them, I just don't know how to dress to match! I might probably throw on the oversized embroidered tunic my mom bought for me from Mexico. 3. I luuurve rose scents, so this is hands down a shoo-in. 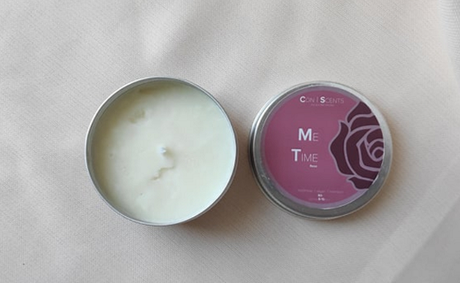 Con Scents Me Time Candle - As soon as you open the can, sweet rose wafts through the air, lifting my senses. I don't need (nor plan) to light it up. I want to just take a whiff of the scent forever! 4. 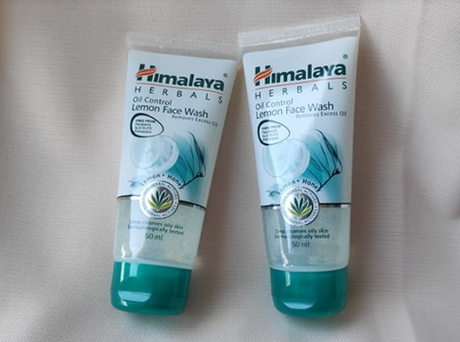 Himalaya Herbals Oil Control Facial Wash - I got a pair of these babies, one for me and probably one for my hubby. He prefers using his own bar of soap though, so weeee this means more goodies for me. This facial wash has a very mild lemon scent, that it almost smells like it's meant for men. I don't know how to explain the scent, other than it's not citrusy at all, very mild, clean and almost musky. Or maybe it's just me. What I love about this facial wash is that it does't completely strip my face of moisture. I always end up having a clean face with no breakouts whatsoever. 5. 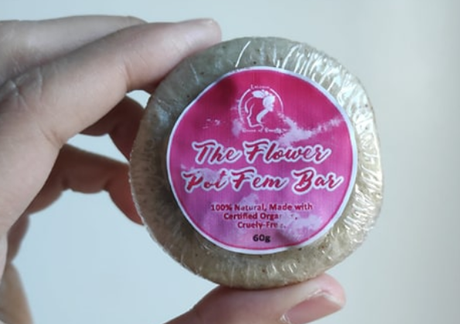 Last, but definitely not the least on this list: Leiana House of Beauty's The Flower Pot Fem Bar. The packaging might need a bit of work, since it was incredibly difficult for me to read all the fine print on the back of the soap. Once unwrapped, the soap showed off an embossed five-petal flower, and a nice herbal scent (like woody, citrusy herbs). I like this bar's scent--it reminds me of Mukti Botanicals' facial wash. Mukti is an Australian brand of organic skin care line, and I've tried some of its products several years ago. I enjoyed that brand, although I cannot afford it now. Whenever I use this bar, it brings back great memories of that time I was thinner and younger (haha!) I love how it cleans, and it's versatile enough to use on my body. It's a little too soft, though. Final Love Notes The Valentines Box from Happy Days Club is terrific! Aside from these five products, I also got goodies from Dermcare, CocoLine, Nyogi, Softex Hello Kitty and Ladouce--items I already got from previous boxes. I love that I get local brands to try. It's terrific. 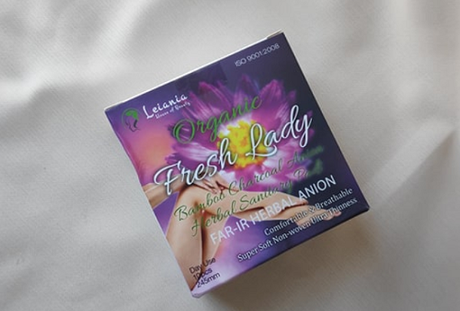 I learn about local products, I discover how awesome and world-class they are, and I help ladies handle their periods better. Love it! Thanks so much, Happy Days Club!